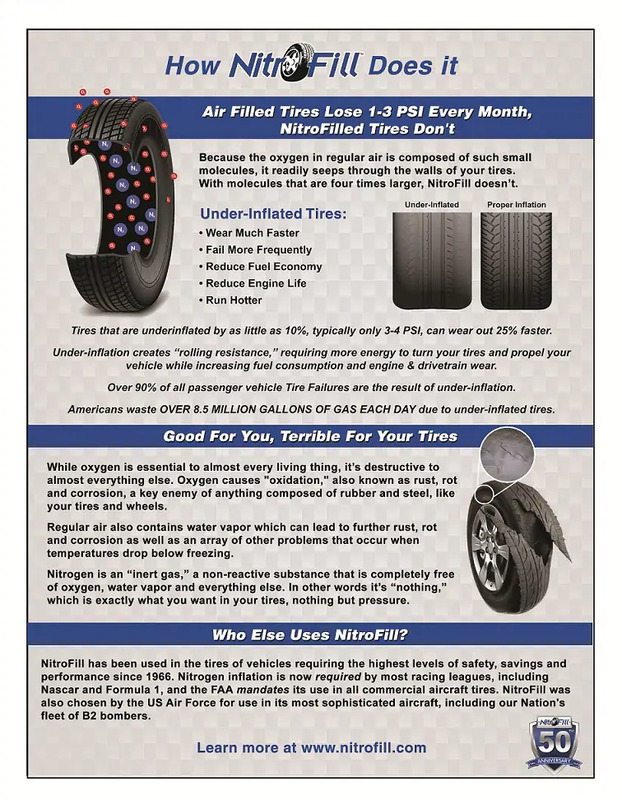 Inflating and maintaining your tires with NitroFill's patented, ultra-high purity nitrogen inflation product can do wonders for them, as well as your vehicle and even our planet. Tire Inflation Study (See full report at www.nitrofill.com. "Nitrogen in the News"). Fuel Consumption Savings based upon EPA's published Annual Average Fuel Economy for US Passenger Vehicles: 24 MPG x 12,000 annual miles over 24,000 mile life of tires. **Complete details are provided upon customer registration and benefits may vary. See your NitroFill Dealer for more information.